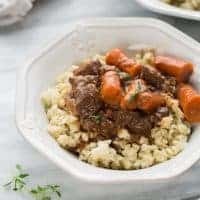 Instant Pot Beef Burgundy! A COMFORTING beef stew cooked until it’s fall-apart tender in a flavorful red wine sauce. Press the saute key on the instant pot. Wait for the pot to say “HOT” before beginning cooking. Spread the beef out in a single layer on a cutting board. Season the beef with salt and pepper. Sprinkle 2-3 tablespoons gluten-free flour over the beef and toss to evenly coat on all sides. Shake off the excess. Remove the beef from the instant pot and set aside. Add the onion (and another tablespoon of olive oil if needed) to the instant pot and cook until softened, about 3-4 minutes. Add the garlic and cook for 30 seconds. Add the wine and scrape the bottom of the pan to remove the brown bits. Let cook for about 5 minutes until reduced. Add the tomato paste and stir to combine. Add the remaining ingredients as well as 1/4 teaspoon salt and 1/4 teaspoon pepper. Place the lid on the instant pot. Press the MEAT/STEW button and set the time to 40 minutes. After cooking is complete let sit for 10 minutes, then vent the pressure to open the pot. Season to taste and serve. Enjoy!